The beginning of each school year is a reminder of how quickly time flies. It’s an opportunity to make memories that will last far beyond the classroom years. And, whether it’s kindergarten or senior year, sometimes a simple “You can do it!” helps remind kids that you’re rooting for them, no matter what. I wish I had this for my first 2 boys but better late then never. I am able to capture my youngest son who started Kindergarten and my 2 daughters which one will start Pre-K next year. The Pics 'n' Props School Days Activity Kit is a fun way to capture your child as they grow up in a quick and easy set. It comes with everything you need to shoot fun Back to School photos from Pre-K to Graduate!, as well as a cute frame to show off your new photo each year. o Pics ‘n’ Props School Days Activity Kit: Capture a child’s first day of school in a creative way with the snap of a camera and Hallmark’s Pics ‘N’ Props School Days Activity Kit. The kit includes chalkboards and a frame to document the first day each year — from kindergarten to senior year! Add your photos to the included “My First Day!” photo album to create a lasting memory that can be admired throughout the years. o Back-to-School Greetings: The newest back-to-school greetings feature furry friends to help you say “Go get ‘em!” to the kiddos in your life. 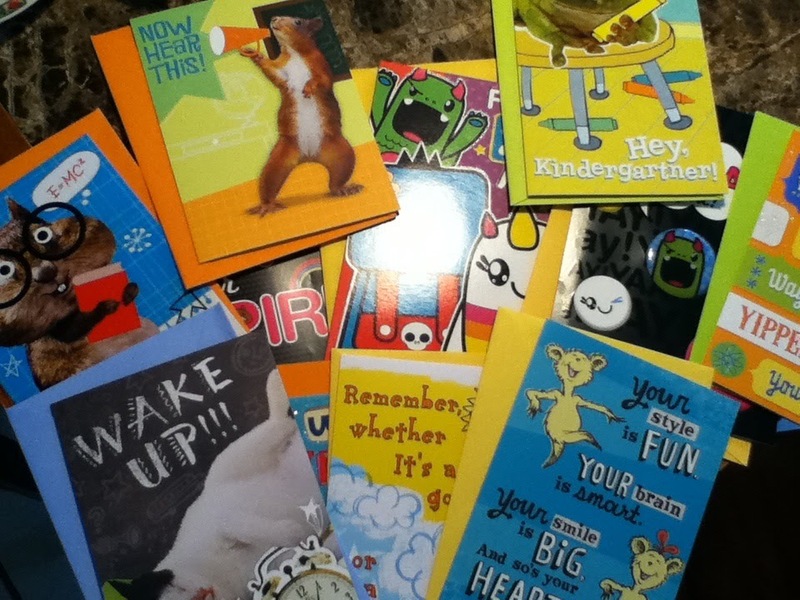 SO many fun cards for Back to School! I didn't even know that was a choice in card giving. Some of them even have shoelaces! I am blessed to know many children and will have a great time giving some of them cards for their first day of school. My son is in 6th grade. I want to win this for my niece who starts Kindergarten this year. My son started Kindergarten this year! Not yet, she'll start kindergarten next year. Yes, she is going into 6th grade. Preschool for my little guy! Going to be in Kindergarten. Heather is in college - Amy's son, my grandson, is not in school yet - he could use this for his entire school life! My son started 5th grade this year.